Festool Hobbyists....What is your day job or business? Re: Festool Hobbyists....What is your day job or business? Mechanical engineer. Worked in a variety of industries ranging from connectors, semi conductors, computers and now bio-medical. Currently I specialize in design of injection molded plastic parts. Ever since I discovered the ETS 150 non-numbing sander, it has been a slippery slope. Domino, MFT, routers, more sanders. Just putter around doing small projects around the home. Sure I could list a bunch of stupid slave jobs, but if anything I suppose it only means I'm a professional loser. It's amazing what you think of people as a kid, and then you turn out to be your own biggest disappointment falling in foot steps of people you thought were fools. However I'm really enjoying reading all the interesting jobs on here. I get to visit tool shops for a living. I also have the opportunity to buy tools at a slightly more affordable price, unfortunately this means that I do! Family Medicine. Glad to see a number of MD's in the list. If it make you feel any better I'm just a loser too. I am the Kitchen and Bath/departments 29,70 and 85 supervisor for a Home Depot in the Central Coast, California. I get to work in a toy store all day, so to speak. Unfortunately Home Depot doesn't carry my favorite toys, Festool. So I'm gonna bring up an old thread. I was working the other day and decided to bust out the old cell phone and record a little something. I'm a shop tech and work on Limitorque actuators. The actuator controls the opening and closing of valves. All types and sizes of valves. You can use the actuator either manually with the hand wheel on the front of the unit or electrically, AC or DC. I can install lots of different options in the actuator. It all depends on what the customer wants. This video shows a 120v 1ph actuator with 4-20mA feedback. Basically, the customer wants to know what position the valve is in, and at what percentage. I'm an mechanical guy that repairs and does make maintaince on towable vacation homes. Specially for a brand thats called kabe. This one i suited for going away on a winter day. The builders of that one claimes that if it outside minus 35 degrees you will be able to get inside it 20 degrees. What is the purpose of the handwheel in the video? I noticed that it seemed to not be moving as the valve closed. Willy, The hand wheel is for manual operation. I guy can walk up to the actuator in the field, lift up on a declutch lever to engage the hand wheel. The declutch lever is the blue handle under/behind the hand wheel in the picture towards the ground. If for some reason something goes wrong electrically, say the motor burns up or a power loss, by engaging the declutch lever you can turn the hand wheel and open/close the valve. If the hand wheel turns while the actuator is operating then something is wrong inside the unit. The hand wheel should not move while the actuator is running. The actuator controls the open/close function of the valve. Valves are in waste water treatment plants, steel mills, power plants, natural gas facilities, chillers and dampers, just to know a few applications. Any place that uses pipe lines and valves can have an actuator attached to it. So where is the guy who started this thread been missing now for 5 months?? His day job has really taken him away this time. @SittingElf is a helicopter pilot working in the oil industry and is also in the armed services reserves. There is a real possibility that he is unable to post on the internet due to job requirements. Additionally, in the past there was some postings here that could have encouraged him to vacate the forum (and I wouldn't blame him). maybe he will pop in and let us know that he is ok. 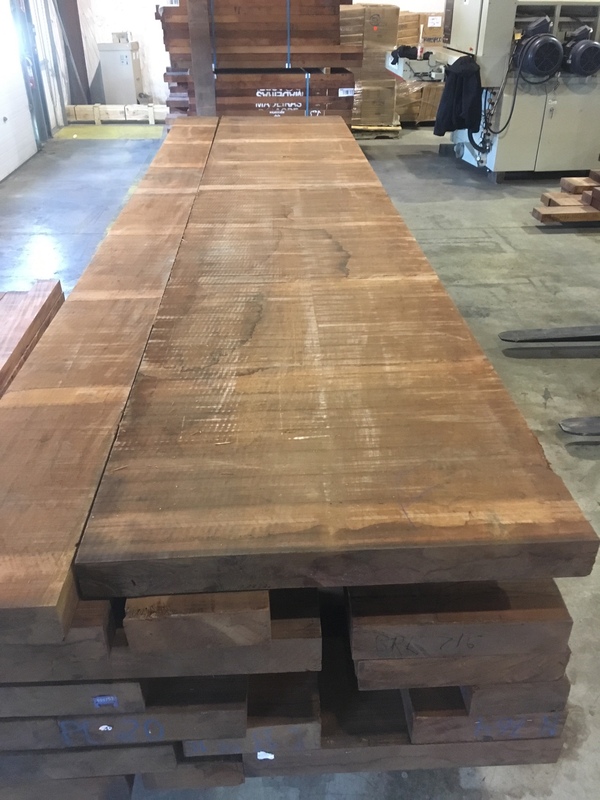 Wanted to add to this thread after we came across some BIG wood during our latest shipment. This was a piece of Mahogany that got delivered today. It has got to be 15 years since we've gotten pieces this size, we always use 10/4 & 12/4 for our guitar necks, in general the boards come in 12"-20" in width, length is normally 10'-15' So today, in comes this monster, 14' in length, 38" in width 12/4, so that comes out to 133 board feet, almost perfectly flat sawn all the way across. Lawyer by day and tinkerer/hobbyist on projects during evenings and weekends. Wow! Those things are awesome! They make such a difficult job and make it so simple. I'm a Storm Namer by day. General Surgeon is my skilled trade. Fishing, hunting, renovating a 110 year-old-house and maintenance on a rental property are my part time diversions. I used to do a lot of woodworking and am revisiting the passion now that the first grandchild arrived. I do. Worked on all makes of pneumatic actuators for many years. Fisher, Copes-Vulcan, Masoneilan, Century, you name it. But very little Limitorque, though the places I have worked have hundreds of them mounted on valves up to 120" diameter. I'm a software engineer. Been doing it for 10 years and recently got into woodworking and home reno-lite projects. It just doesn't seem right to chop that up into guitar necks. It deserves a better future. Another Police Officer here - 14 years in the Job and a couple in the British Army before that. I am currently a Custody Sergeant, which involves overseeing the 24 hours that most people can spend under arrest before we need to charge or release them. I am also a trained Evidence Recovery Manager for mass casualty incidents - owing a scene until all victims and property have been documented and recovered. I'd like to reduce my hours at work and take on some paid carpentry work before too long - but a house renovation and extension keep getting in the way! Job??? What is this job thing of which you speak? Oh yes, now I remember...about 8 years ago I retired from a 40 year stint as an automotive engineer. Since I posted before, I've gone back to driving a concrete mixer, which I like a lot better. Week and a half on the job and it's like I belong there.